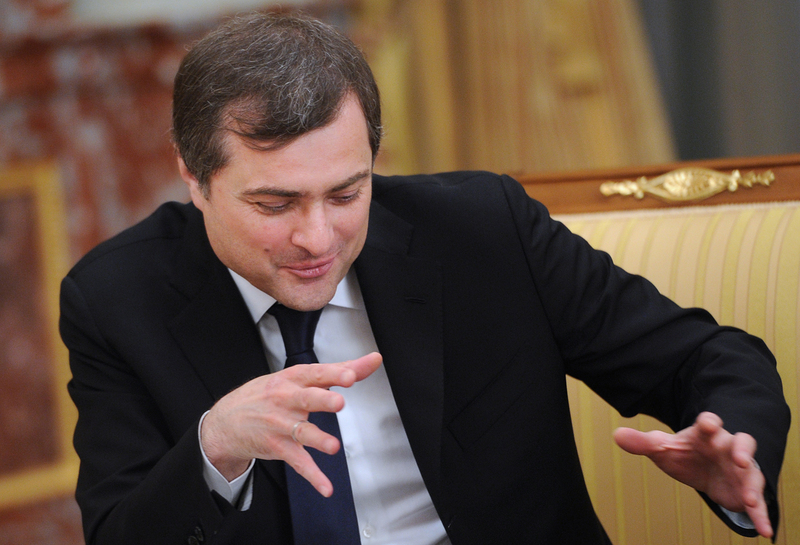 Government chief of staff Vladislav Surkov at a meeting of newly appointed government ministers in Moscow, Russia. on May 21, 2012. The news that presidential aide Vladislav Surkov's emails have been hacked has created quite a stir both in Russia and Ukraine. Among other things, the hacked emails allegedly contained a plan aimed at destabilizing Ukraine. A group of Ukrainian hackers has released what it says is email correspondence from Russian presidential aide Vladislav Surkov that proves the existence of a Russian plan to destabilize Ukraine supervised by Surkov. "It is necessary to create favorable conditions for entry into the new Parliament of Ukraine by managed political forces whose leaders declare peace in the Donbass, which will allow additional levers of influence on the Ukrainian political leadership to be created," reads a pdf document the hackers claim was emailed to Surkov as part of a plan codenamed "Shatun" (Russian for a bear that has not gathered enough food for the winter and is unable to hibernate), which is due to be implemented during the period from Nov 2016-March 2017. These revelations were made in late October by Ukrainian hackers calling themselves CyberJunta, who claim to have hacked into the email account of Surkov’s office as well as his private email account, and over the course of two days dumped online the contents of both mailboxes. Who is behind the killing of Donbass commander ‘Motorola’? For more than a decade, Surkov oversaw Russia’s ruling party United Russia; he also masterminded the establishment of its offshoot, the controversial youth movement Nashi, as well as being responsible for an overhaul of Russia's electoral system, isolating the opposition and liberal media. It is Surkov who – throughout the 2000s – oversaw the building in Russia of what he termed as “sovereign democracy,” a Russia-specific model of democracy that rejects any outside interference. The expression "Surkov propaganda" (meaning the loss of media independence) has become so embedded in the Russian mass consciousness that it is still used today, although Surkov no longer works in the presidential administration – he has been serving as a presidential aide since 2013. Officially, he supervises Georgia's breakaway regions of Abkhazia and South Ossetia; unofficially, also Ukraine. In that sense, the Ukrainian hackers' choice of target is no accident: If one were to look for a plan to destabilize Ukraine, the most logical place to search for it would be in the depths of Surkov's emails. Russian officials greeted the story with amusement. According to Kremlin press secretary Dmitry Peskov, Surkov is a "very talented" person but does not use email at all (Surkov's office does have an email account but it is curated by Surkov’s secretaries). "It is not him," Peskov insisted, adding that talented people often have many things ascribed to them. Public debate on whether the emails were genuine or not soon boiled down to a popular conclusion: There was a real hack and the files are real, but are a blend of truth and fiction and were deliberately leaked. For instance, the published dump includes scans of Surkov's passport and the passports of his family members as well as a lot of typical routine correspondence, which has been seen by many as convincing proof that the email account is real. However, a number of doubts about the authenticity of the plan have been raised, with journalists and social network users pointing out a number of glaring inconsistencies. As Ukraine peace talks fail again in Berlin, did Putin have other aims? For some reason, the Shatun plan was sent to Surkov’s email account with Yandex, a free email service used by millions of Russians. Internet users were quick to point out that the objectives and tasks of this type of plan would be considered classified information and top secret and so would be unlikely to have been sent as an attachment to a private email. Another talking point was the format of the file containing the plan, a scanned PDF document. “Is this how they do it in Ukrainian corridors of power – first print out a text, then scan it and then email it?” asked Marina Yudenich, a former official from the Russian presidential administration. Other things that raised doubt were the abundance of Ukrainian phrases in the emails, spelling mistakes and expressions such as “we shall manipulate.” As Kiev-based blogger Roman Shrayk pointed out, the phrase seemed to come from “the vocabulary of vaudeville villains” and in real life not even a confirmed manipulator would ever write something like this. That said, some believe that the published plan appears quite plausible, including Anton Herashchenko and Zoryan Shkiryak, advisors to the Ukrainian defense minister. Security Service of Ukraine chief of staff Oleksandr Tkachuk has also said that the majority of the documents are genuine. Vyacheslav Volodin: Could the new State Duma speaker be the next president? In Russia, the view of the alleged plot is rather different: It is a Ukrainian act of provocation aimed to discredit Surkov, a key ”shadow” overseer in the Ukrainian peace talks alongside U.S. Assistant Secretary of State Victoria Nuland (some have even joked about the existence of a Surkov-Nuland plan). At the latest Ukraine peace talks in Berlin, Surkov was sitting to Putin’s left, despite the fact that he is on the list of officials subject to EU sanctions and technically had no right to enter Germany. Editor-in-chief of the independent radio station Ekho Moskvy Alexei Venediktov pointed out that CyberJunta had released only incoming email messages. “We always know that selectivity means manipulation,” he concluded, adding that the plan of “how we break up Ukraine” may have been sent by a “local idiot.” Presidential aide Surkov probably gets many letters like these, Venediktov suggested.